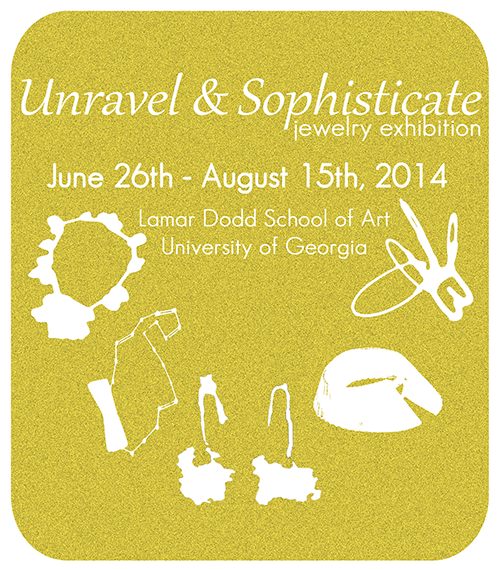 Unravel & Sophisticate is an exhibition that showcases work by recent graduates and current students of jewelry programs both nationally and internationally. The purpose of this exhibition is to engage jewelry in the fine art setting and to show jewelry that is being made from artists who are academically trained. The thirteen emerging artists selected are working with different materials and techniques inspired by conceptual ideas such as memory, familiarity, landscape, and wearability. The exhibition is placed at Lamar Dodd School of Art, Athens, Georgia, United States.